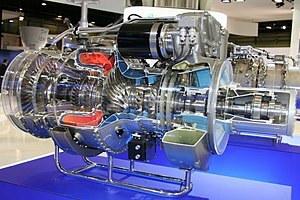 The Rolls-Royce Turbomeca RTM322 is a turboshaft engine produced by Rolls-Royce Turbomeca Limited, a joint venture between Rolls-Royce plc and Turbomeca. The engine was designed to suit a wide range of military and commercial helicopter designs. The RTM322 can also be employed in maritime and industrial applications. It was designed for the Hughes AH-64 Apache and Sikorsky Blackhawk, competing with the GE T700 and the Pratt & Whitney Canada PW100. The partners shared equally the £100 million development costs, Rolls-Royce makes the turbines, the combustor, and the inlet particle separator while Turbomeca produces the axi-centrifugal compressor and intake. It first ran on 15 December 1984, with eight bench prototypes for 30,000 cycles and 13,000 test hours, and four for flight tests, initially aiming for a 1987 certification. The first order for the RTM322 was received in 1992 to power 44 Royal Navy Merlin HM1s which subsequently entered service in 1998. Over 1,100 engines are in service, having logged over one million flight hours, powering 60% of the AW101 fleet and 80% of in-service NH90s. In 2013, Turbomeca acquired the entire program, becoming responsible for both production and product support. Turbomeca's successor, Safran Helicopter Engines, developed it in the Aneto. ^ a b c "First RTM 322 runs" (PDF). Flight International. 5 January 1985. ^ "RTM322". Rolls-Royce plc. Retrieved 16 March 2009. ^ a b "RTM322". Over 2,000 shp Propulsion solution. Safran Helicopter Engines. Wikimedia Commons has media related to Rolls-Royce Turbomeca RTM322. This page was last edited on 6 September 2018, at 12:27 (UTC).